*Original story: WHAT A WEEK! We have been so blessed this week. A while back, Lowe’s Home Improvement (Regency location), called us and asked, “What do you need?” The answer was quick and simple, a new deck. 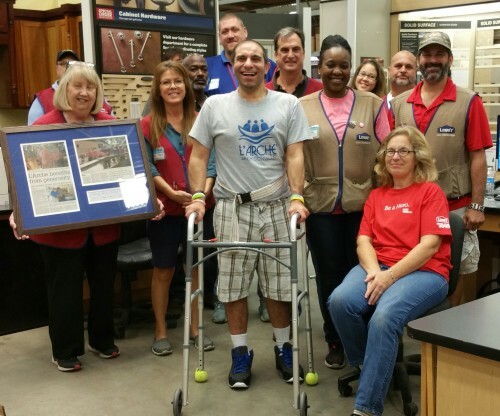 The Lowe’s Hero Project started last Saturday with Store Manager Rob Walls and Lowe’s Hero’s Project Co-Captains, Mary Corbett and Mike Caliphano at the helm. Seven days later, 7 Lowe’s team members and $1500 in materials, we have a brand new deck. The deck is 34 × 17 (much larger than before), 14” high and ADA compliant. Not only did Lowe’s build the deck, they donated two new picnic tables, four umbrellas for our deck and picnic area, new chairs and an assortment of beautiful plants.